Resawing thick boards into thinner material is an ideal job for the bandsaw, but for the cut to be accurate the blade has to be super sharp. The problem is that even if you fit a brand new blade for such demanding cuts it very quickly seems to lose its edge, and sooner or later the timber starts pulling away from the fence, no matter how hard you try to restrain it, (pic 1). This can be extremely wasteful as you end up cutting the material well oversize and planing back the resultant tapered cut. Most bandsaw fences have some form of adjustment to allow you to correct for this lead on the blade, but this is not always successful on deep cuts as you need to keep altering the angle of presentation to the blade. Another alternative is to draw the cut line on the timber and follow it by eye, but this is rarely accurate. Much better is to create a single point fence that allows you to present the timber to the blade at any angle and yet still maintain a constant width of cut. Single point fences have been around for many years and are equally useful if you want to rip curved sections of a constant width. 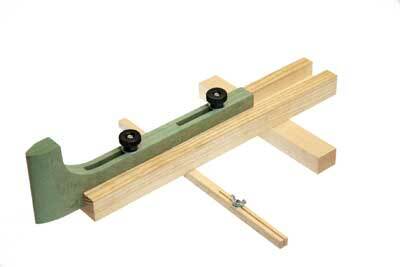 I have seen a plan for this particular jig in several different books and I been using a much cruder version for several years. The prospects of having to re-saw a batch of constructional veneer for a restoration project finally persuaded me to dig out the plans and build this proper version that is quicker to set up and is easily adjustable. Fortunately you do not need much in the way of materials, a few scraps of MDF or hardwood and a few bolts and wing nuts is all that it takes (pic 2). Start by cutting up the MDF into the five pieces to form the adjustable arm. The idea of doing it this way is create the adjustments slots, although you could achieve the same result by routing slots in a piece of solid material (pic 3). Glue the 'sandwich' together and clamp it firmly, preferably leaving it overnight to dry (pic 4), then trim up all the edges and mark out the profile for the adjustable fence reducing it in height to accommodate the locking bolts (pic 5). Shape the end of the fence to a small pointed radius of about 3mm using a disc or belt sander (pic 6). The exact shape is not critical, but make sure the end remains square to the bottom edge (pic 7). Now machine a groove to take the fence in the piece of wood that acts as the carrier. This needs to be a smooth sliding fit but without any play (pic 8). The jig is held in place on the table with a strip of timber that fits in the mitre guide groove, so machine this carefully to make it a tight fit (pic 9). To lock this strip in place you will need a small countersunk bolt and wing. Drill a hole through one end of the bar and then slice it down the middle extending the cut, just past the hole. Tightening the wing nut has the effect of spreading the bar and locking it tight in the groove (pic 10). Attach this locking bar to the underside of the carrier making sure the two components are at right angles (pic 11). Screw an additional support to the carrier at the outer edge of the table. This should stop the jig twisting if you are feeding through large or rough sawn pieces (pic 12). Mark the position of the locking coach bolts and countersink the heads below the underside of the carrier (pic 13). A couple of wing nuts or locking nuts completes the jig. The exact dimensions are not critical and can be varied to suit the arrangement of your bandsaw table (pic 14). Most standard wood cutting blades will rip but for optimum accuracy I prefer to change to a dedicated 5/8" 4 tpi blade, ideally one of the thin section ones that used to be sold as meat and fish blades, but are now more widely available for woodcutting (pic 15). "Tightening the wing nut has the effect of spreading the bar and locking it tight in the groove"